Football season is now upon us. And even though I don't care about it, there are certainly a lot of people who do. So I thought today would be a good time to showcase a series that David Parkinson submitted way back in 2014. I came across it the other day and decided it was time to unleash it on the world. 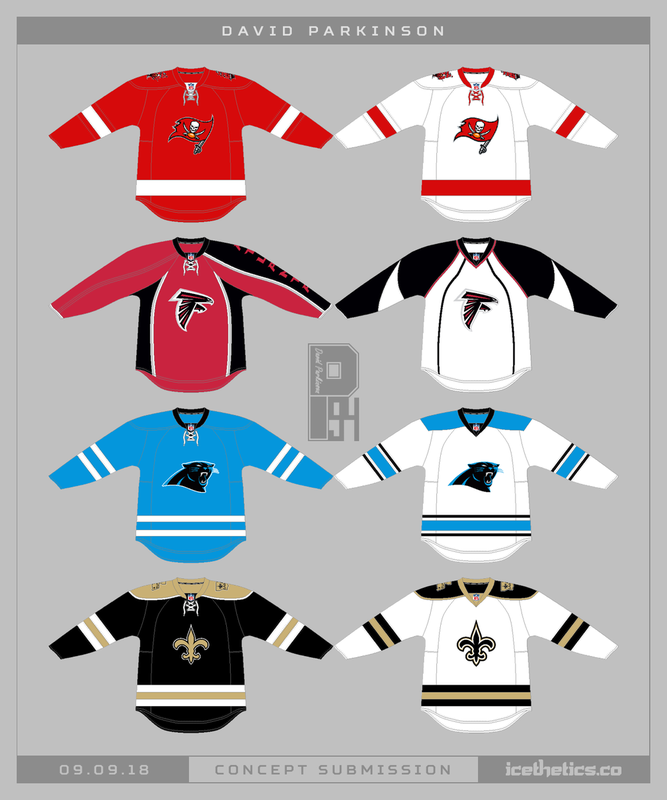 David created hockey sweaters for all 32 NFL teams. He based each team's uniform on their biggest local hockey team. Some were NHL, others were in the minors. All are pretty interesting. Have any favorites? For search purposes, I'm including the names of all 32 NFL teams at the bottom of this post. In the AFC East, we have the Buffalo Bills, Miami Dolphins, New York Jets, and New England Patriots. 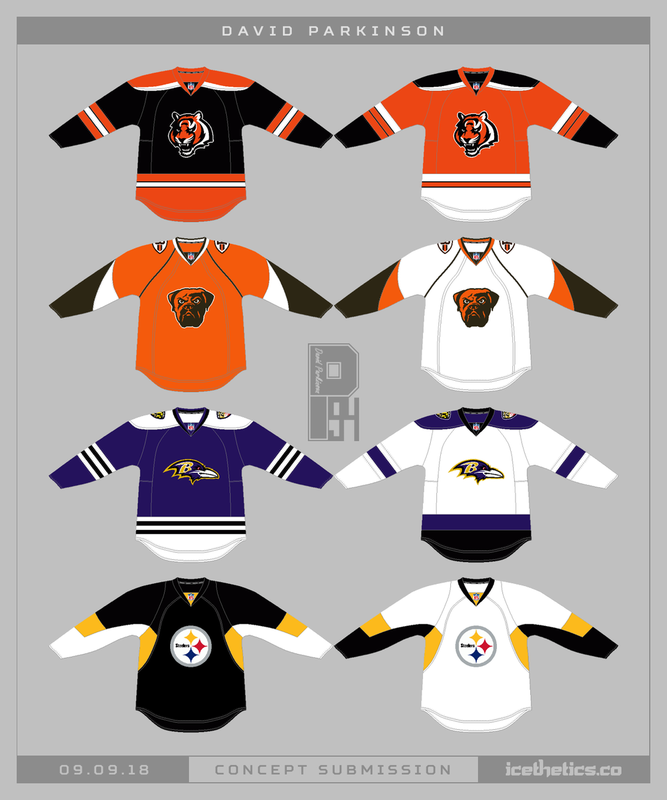 In the AFC North, it's the Baltimore Ravens, Cleveland Browns, Cincinnati Bengals, and Pittsburgh Steelers. 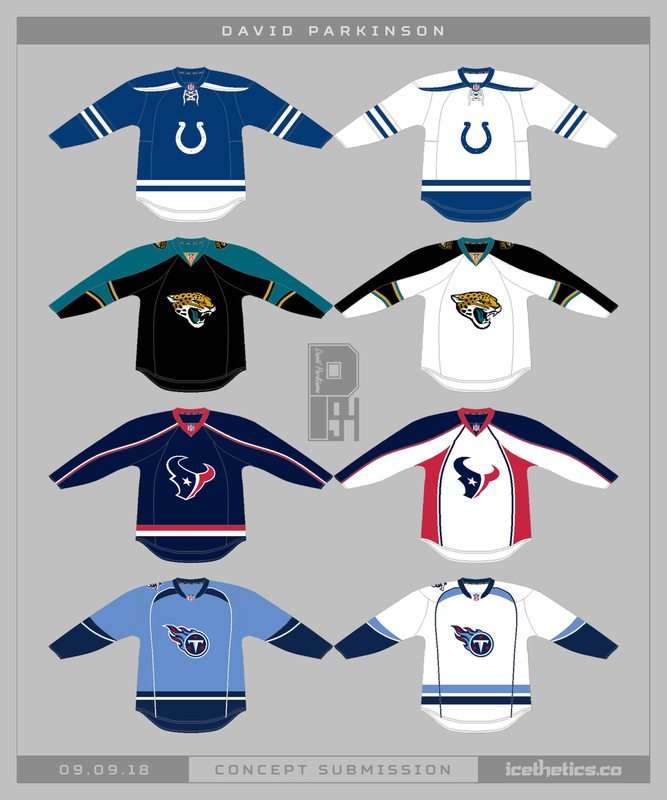 In the AFC South, the Indianapolis Colts, Jacksonville Jaguars, Houston Texas, and Tennessee Titans. 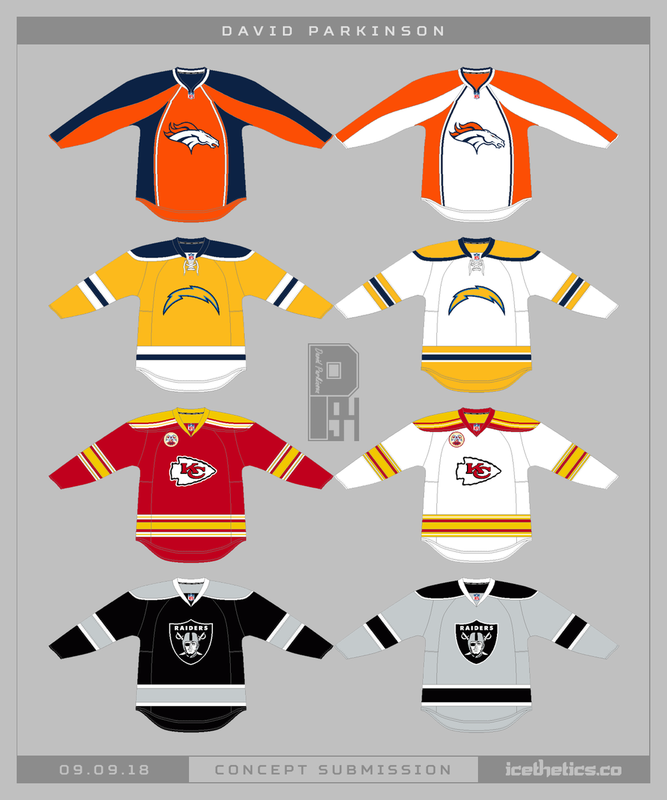 In the AFC West, there's the Denver Broncos, Los Angeles Chargers (San Diego at that time), Kansas City Chiefs, and Oakland Raiders. 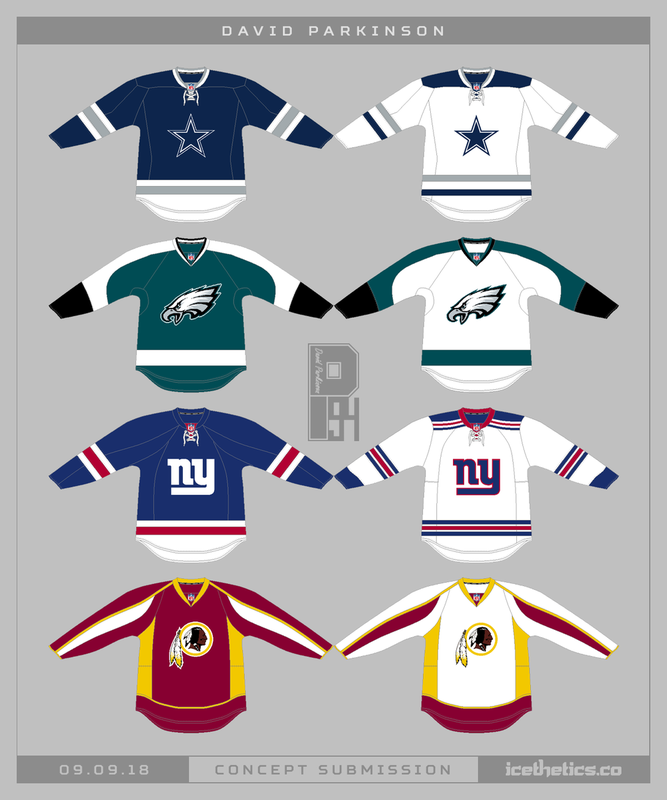 Switching gears now, in the NFC East there's the Dallas Cowboys, Philadelphia Eagles, New York Giants, and Washington Redskins. 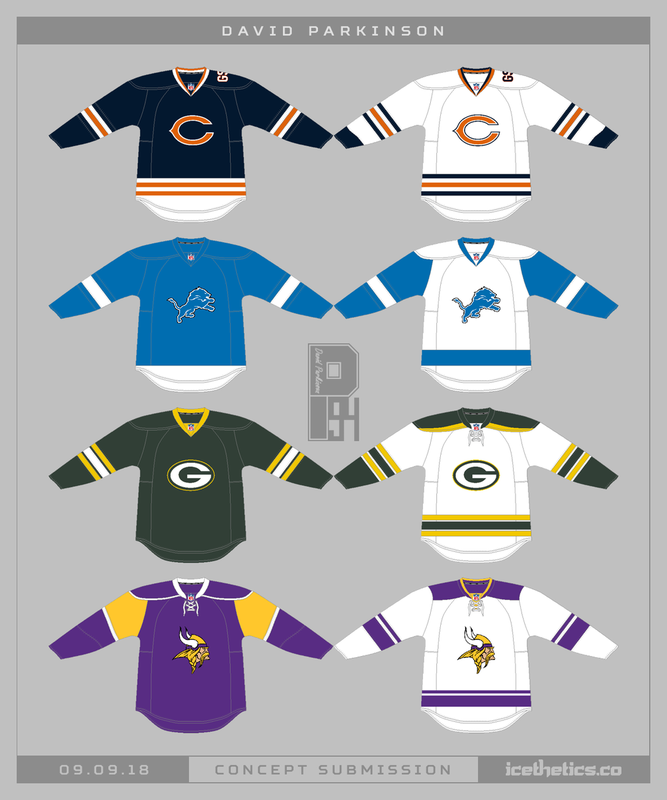 In the NFC North, we have the Chicago Bears, Detroit Lions, Green Bay Packers, and Minnesota Vikings. In the NFC South you find the Tampa Bay Buccaneers, Atlanta Falcons, Carolina Panthers, and New Orleans Saints. And finally, the NFC West includes the San Francisco 49ers, Arizona Cardinals, Los Angeles Rams (St. Louis at that time), and the Seattle Seahawks. A little light on outdoor game concepts, I decided to fall back on a fall classic — College Saturday. David Parkinson provides us a new uniform set for Purdue University. Happy Canada Day! David Parkinson helps us celebrate with today's concept. Imagine the Philadelphia Flyers with that classic Canadiens chest stripe. Thanks to David Parkinson we don't have to imagine. We also never have to see it real life — hopefully. Is this too crazy? David Parkinson redesigns the Calgary Flames' third jersey in black with the secondary logo front and center.